Original Baseball hat for your dog! 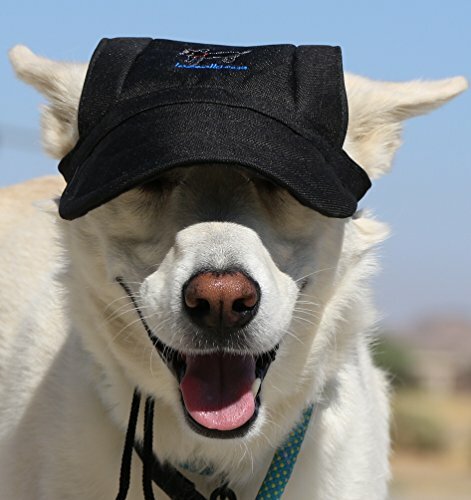 Visor cap can effectively protect your dogs eyes from harmful sun. Attractive design will make your dog for sure the most stylish dog at the park, beach or on a walk! 7 colors to choose from, and three sizes, small, medium and large to assure you and your dog will look great! Each hat is embroidered with the LoveWally logo, & LoveWally tag inside, assuring you each product is really from LoveWally; an authentic USA Company. See the inside tag, which is flipped up in one of the pictures to assure you of our quality. The tag tucks inside the hat when worn. Denim, Canvas exterior with a soft polyester lining Fully Adjustable non-elastic neck strap for comfrt and secure wear Two Ears holes at the top. Breathable Comfortable LoveWally products are designed proudly in the USA from our Maine and California locations. Wally is in charge of product testing and modeling in Maine. Original Baseball hat for your dog! Visor cap can effectively protect your dogs eyes from harmful sun. LoveWally products are designed proudly in the USA from our Maine and California locations. Wally is in charge of product testing and modeling in Maine. If you have any questions about this product by LoveWally, contact us by completing and submitting the form below. If you are looking for a specif part number, please include it with your message.